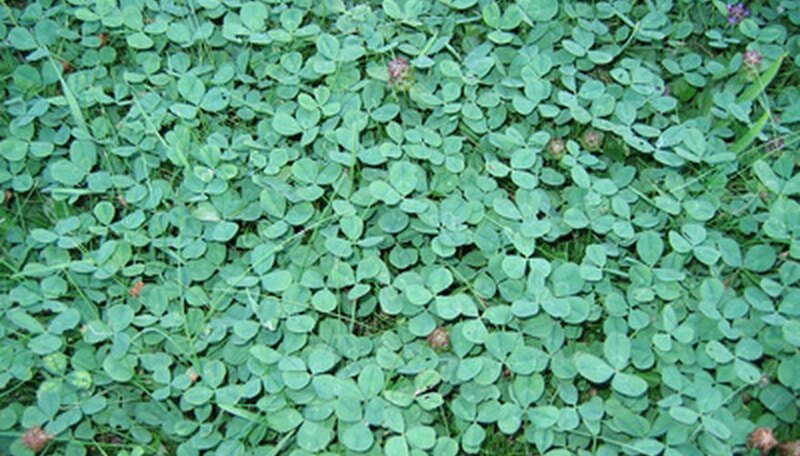 Clover is a perennial legume that often pops up in large patches in lawns in the summertime. But clover is rarely found in healthy, thick-growing lawns. It almost exclusively crops up in thin lawns that have not been adequately fertilized. Once you kill the clover in your grass, prevent it from coming back by seeding thin spots in the lawn and maintaining a regular fertilization schedule. Water the lawn with 1 to 2 inches of water the day before you treat it. Spray the lawn with a post-emergent, broad-leaf herbicide. Make sure it is labeled for use on clover and as safe for use on your specific variety of grass. Use a hose-end sprayer, pump or hand sprayer to coat the clover in herbicide according to the manufacturer's instructions. Stop just before the point of runoff. Re-spray the lawn as needed, at the intervals prescribed by the herbicide manufacturer. Do not use herbicide if the temperature climbs above 85 degrees Fahrenheit. Spray early in the morning on a day with no wind and no rain forecast for the next 48 hours. Use herbicides that contain 2,4-D, dicamba or MCPP/MCPA. Small patches of clover can simply be hand-weeded. Take care not to accidentally spray your garden plants. Broad-leaf herbicides are safe to use on grass but will kill garden plants.